The dormant pseudobulbs of this orchid are the size and shape of ears of unshucked corn (elote). Flowering and initiation of new growth occurs in the spring dry season. 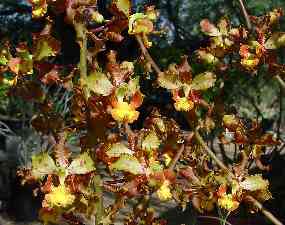 Two- to three-foot branched inflorescences bear hundreds of one-inch brown and yellow flowers. Fans of large pleated leaves expand during the rainy season and fall off soon after the rains end. Plants in leaf somewhat resemble small corn plants. Very large colonies develop on steep rock faces. In our region known only from a narrow zone at the ecotone of tropical deciduous forest and oak forest on the northeast side of Sierra de Alamos at ca. 1000 m. Here it grows among grasses, and tropical elements such as cycads (Dioon edule var. 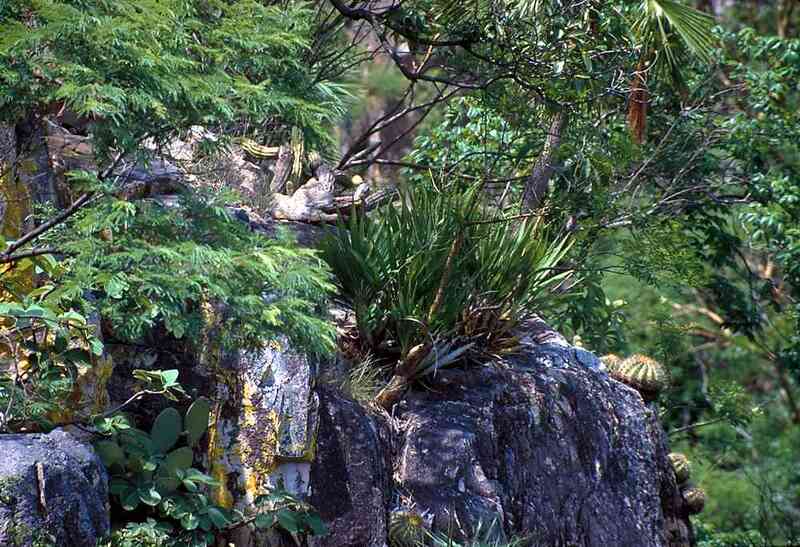 sonorense), various bromeliads including Pitcairnia palmeri, Tillandsia capitata, T. caput-medusae, Plumeria rubra, Pseudobombax palmeri, and the lowermost oaks including Quercus albocincta, on steep, north-facing rock ledges of canyon walls. SE Sonora and Florida to South America and the West Indies. This is the largest of the tropical, pseudobulbed orchids in the region. 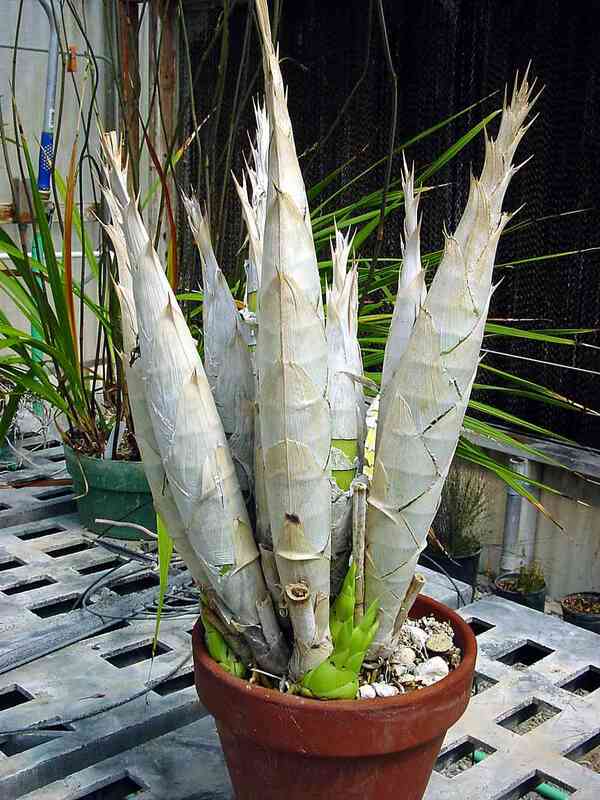 It thrives in cultivation if grown with high light intensity and high temperatures and humidity during the summer growing season. 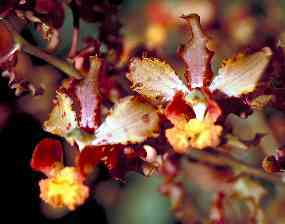 Flowering fails to occur unless the plants are kept absolutely dry during the winter and spring until initiation of inflorescences and new growth. In cultivation it seems to flower every other year. In Sonora it is susceptible to overcollecting, but it is widespread and common elsewhere and has long been available in the horticultural trade. Easy and vigorous in cultivation; not growing larger than the biggests wild plants. 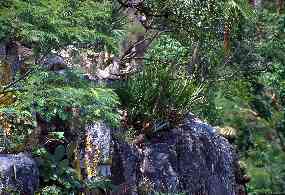 Description: Robust plants in rock crevices; forming dense clumping colonies. Rhizomes very short and thick, seasonally producing masses of white roots. Pseudobulbs clustered, spindle-shaped (fusiform), the larger ones 44.5- ca. 50 cm long, to 5.2 cm diameter, closely clothed in the persistent leaf sheaths, these forming sharp, raggedly pointed edges at the line of abscision or articulation. (New growth appears just before the onset of summer rains and the leafy shoots rapidly develop and remain leafy only through the summer rainy season, the blades rapidly yellow and abscise in September or perhaps early October. For most of the year the plants are without green leaves. The inflorescences appear in spring.) Leaf blades articulated and quickly drought-deciduous, the blades 39-64 cm long, 6.2-7.2 cm wide, linear-elliptic, thin, somewhat pleated, with a gradually narrowed, acuminate apex. 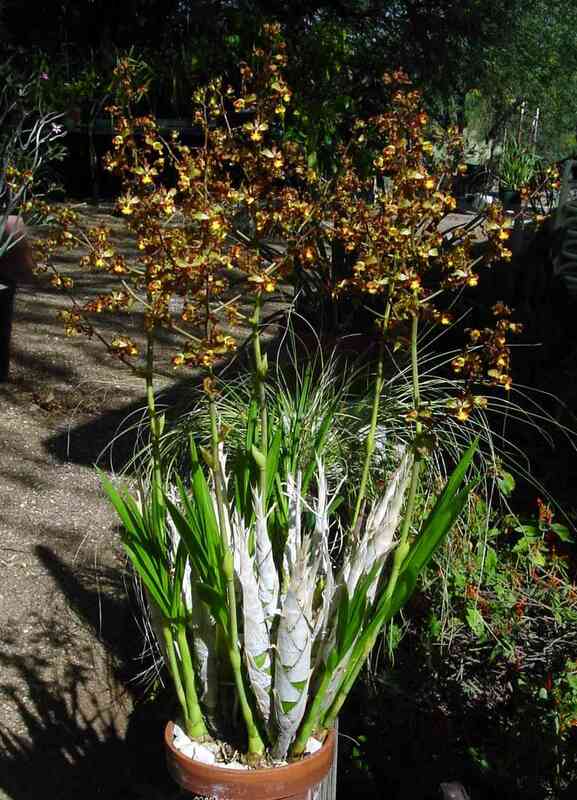 Flowering stalks stout, lateral from the base of a previous year's pseudobulbs, erect, stout, the inflorescences paniculate, much overtopping the pseudobulbs, with yellow and brown foliaceous bracts. Bracts and flowers showy, markedly ruffled (undulate), and similar in color, texture, and pattern of marking. Flowers ca. 3.5 cm wide, yellow and brown. April-May.